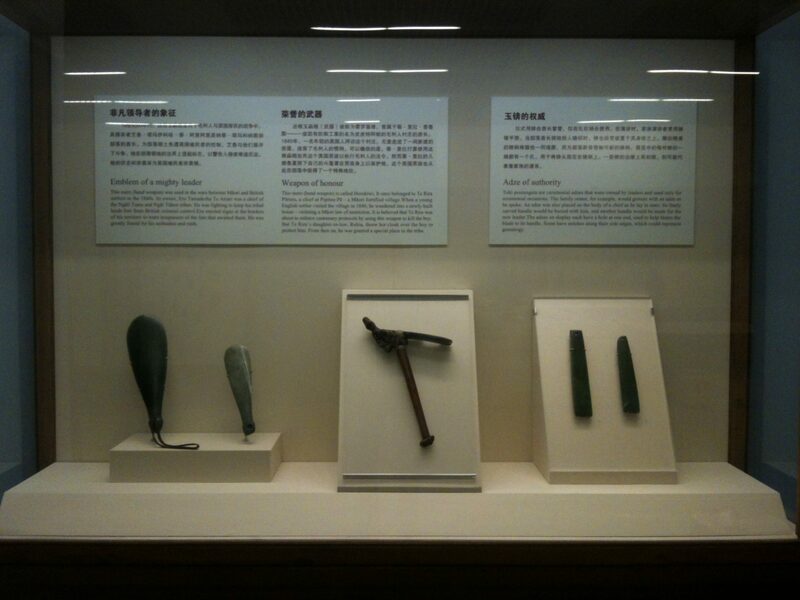 Kura Pounamu is Te Papa’s first exhibition of Maori Taonga in China since the National Museum sent Maori artifacts in 1978. The mutual appreciation of ‘green stone’ jadite (jade) and nephrite (pounamu) provided an ideal platform for re-establishing a cultural exchange. The exhibition required ease of installation and minimal object handling to ensure the safety of the taonga. This meant Object Support staff had to find innovative and aesthetic solutions to display all 216 objects. Small and fragile items, matau (fish hooks), pendants, and hei tiki were all stitched to acrylic panels. Fishing line was selected for it’s strength and transparency and the anchor bend knot was selected for absolute non-slip security. Curator Dougal Austin condition reporting all 216 objects, November 2012. Callum Strong. Larger items like mere and toki were displayed on stainless steel mounts, carefully welded to exact dimensions of each unique taonga. 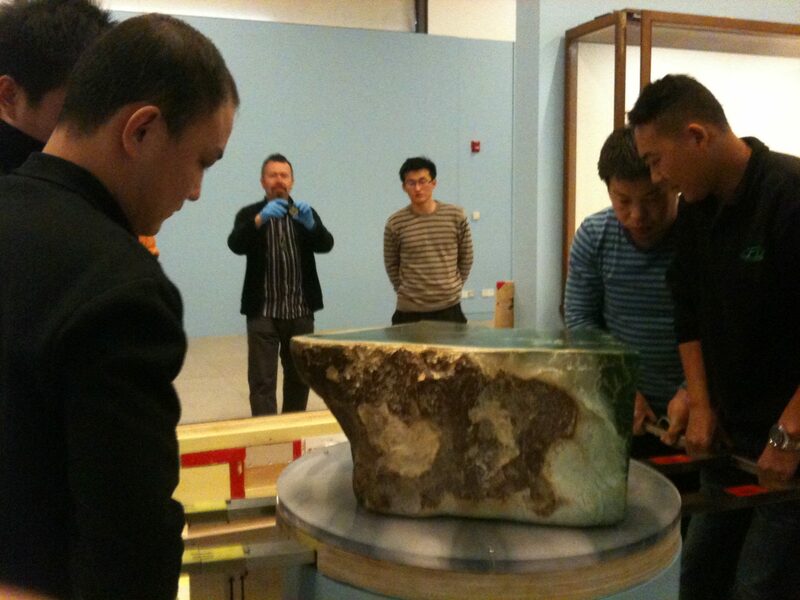 Large touchstones were supported on thick acrylic disks, mounted on plinths. The heaviest weighed nearly 200 kgs! An intricate lifting apparatus was designed and fabricated by Object Support staff so that it could disassemble to fit in the crate and be re-assembled on site so either a forklift or six strong people could lift the touch stone into place. Yi, er, sun TAI (one, two, three LIFT!) Was the first thing Transit Preparator Callum Strong learnt for his role supervising the install at the National Museum of China. The installation went very smoothly with just two minor alterations required to fit the display cases. 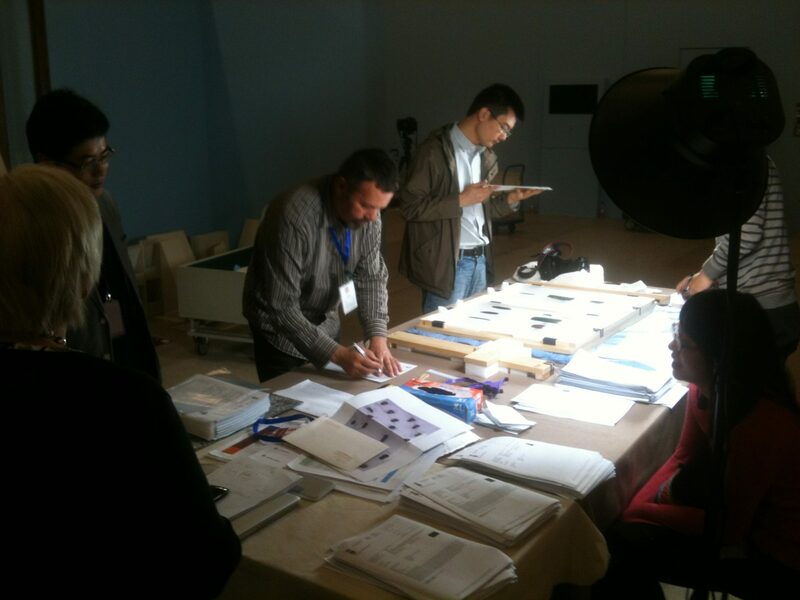 The exhibition team of NMC included amazing craftsmen. After some sign language, quick sketches and lots of nodding they fabricated a new lift and mount to maintain the overall quality and safety of the show. The staff of the NMC were welcoming, friendly and very appreciative to be displaying the national treasures of Aotearoa. Xie xie. Xie xie. (shee-ya) Thank you. Thank you. This is a fantastic example of cultural enrichment between China and New Zealand. On our recent travels through China we got to meet one of the only 70 or so master carvers. These pictures are of one of his creations: http://www.mountainjade.co.nz/blog/expose-the-possibilities-3/ He’s waiting for a fearsome fanged creature, holding a sword, to approach from its bottle (it’s a genie! ).